I wrote in my last review, White Butterfly by Walter Mosley, that the next couple of books I reviewed would be from authors I’ve been wanting to read for a long time. For many years, I’ve been wanting to read Louise Erdrich. I had seen her books at bookstores and had picked them up several times planning to buy one but never did until now. Tracks is the story of two Native American families: The Kasphaws and Morrisseys told by one member of each family in alternating chapters. The novel covers a twelve year period where the old ways of Native life are being changed by the white society that surrounds them. Well, I have to write that Louise Erdrich writes beautifully even poetically. However, I must say that I found Tracks uninteresting. The story for some reason didn’t engage my imagination and I felt distant and remote from most of the characters. It would have been easy to stop reading the novel after the first few pages…but I’m the type of reader that doesn’t give up easily and I was determined to finish it. I know I just probably put some frowns on the faces of readers who are fans of her work. Nevertheless, I did find the character of Pauline Puyat, one of the narrators of the novel, somewhat interesting. Her conversion from the tribe’s old spiritual ways into Catholicism was powerful and heartbreaking at the same time. 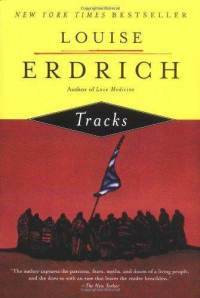 Tracks was not my cup of tea but glad to have finally read Louise Erdrich and satisfied my curiosity about her work.